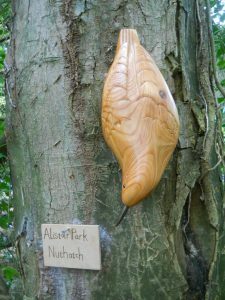 These carvings of birds were made for ‘Woodland Arts’, an exhibition in Leigh Woods, Bristol in 2017. I like making new pieces to show in events like this one. Although it can be time consuming, it always gives an opportunity to explore themes that interest me but perhaps haven’t come up in my commission work. 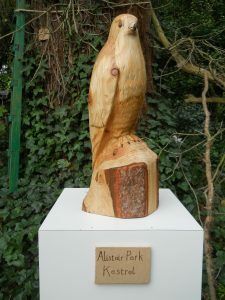 I hadn’t carved a bird sculpture for quite a while, and the woodland setting for the show seemed to make them an ideal subject. Kestrels (as above) and nuthatches (shown below, poised to run down a tree trunk as they do) are both birds that interest me and that live around these woods, so they were the ones chosen. 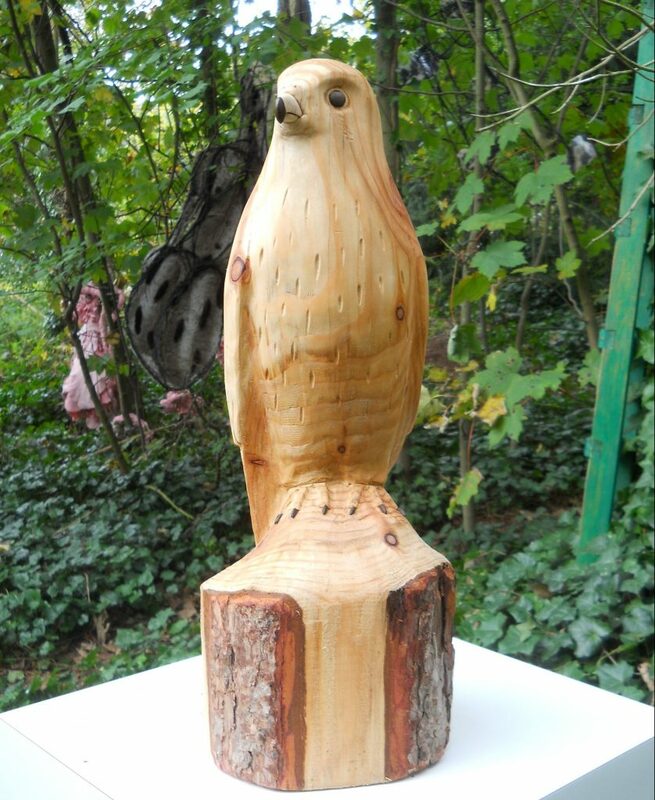 For the bodies of each bird, I used European larch timber. These were timber offcuts from companies that share the area that my workshop is in. Larch isn’t particularly easy to carve with traditional hand tools, no matter how sharp they are, so much of the work was done with abrasive discs fitted to angle grinders. This also gave the carvings a smoother, slightly abstract feel which I really like. The pale wood in the kestrel’s beak is hornbeam, taken out during building work at Bristol’s Southmead hospital. 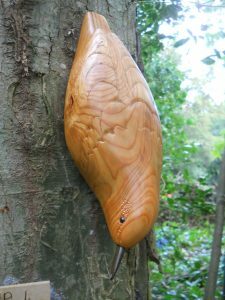 The dark wood used for the eyes and the beaks is a bit of Bristol’s heritage. It is a timber called greenheart, from offcuts which were given to me by a furniture maker friend named Jim Sharples. 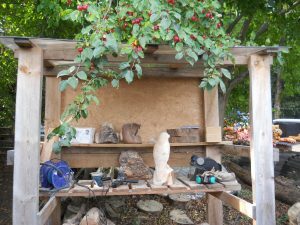 Jim had made a large bench to be placed near Bristol’s ‘Mshed‘, using wood from the old North Junction lock gates which led from Bristol Harbour to the Avon Gorge and then the sea. The huge trunk of tough African greenheart wood lay on the top of the old gates, to protect them from bumps by ship’s hulls. It was removed when the gates, which were fitted in the nineteenth century, were recently replaced. These small bits of wood are really pieces of Bristol’s maritime history.